As Raph falls, he manages to wrap the rope around one of the mobsters on the balcony, which slows his fall, but he burns his hands badly on the rope as he grasps it and attempts to swing onto another balcony far below. The momentum is too great, however, and rather than landing on the balcony, he crashes through a window and lands in a heap. Donatello is following Casey, trying to ensure that he doesn’t get into trouble. As Don spies on his friend, he falls asleep and when he awakens, Jones is gone. Elsewhere, Casey is walking when he is accosted by three street hoods who demand a toll. Casey flips them a quarter and the leader threatens him with a knife, demanding more money. Jones digs through his bag pretending to look for his wallet, but instead dons his hockey mask and grabs his baseball bat. Casey then smacks the punks around and then wanders off, warning them that they had better not be around when he comes back. Unfortunately, one of them is carrying a gun, and he shoots Casey in the back. The hoodlums then surround Jones and move in for the kill, but Donatello shows up and runs them off. Don picks up Casey and heads towards the hospital. At Aprils’ apartment, Mike wakes Leo to watch a news bulletin about giant bat mutants attacking people. 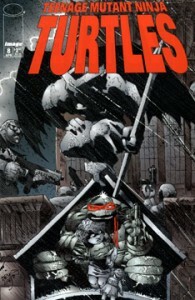 April gets a call from Donatello and heads out to the hospital, while Leonardo leaves to investigate the bat creatures. Mike stays put until Raph checks in, and soon after the others have left, Raphael appears, torn and battered from his ordeal. Raph collapses into Mikey’s arms and tells him all about his adventure and where Shadow is being held. Mike cleans Raph up and puts him to bed and then goes out to save Shadow on his own, in attempt to make up for losing her in the first place. Mikey arrives at the apartment and overhears a mobster that reveals Shadow is now with Big Tony at St. Paul’s Cathedral where he’s having her baptized. Mikey heads over to th echurch and grabs Shadow in front of the entire crowd, running off with her. The mobsters chase Mike up to the bell tower, but Mike manages to escape. Big Tony’s nephew Joey is called in to find Shadow. Back at the hospital, April and Casey are making up when Mike arrives with Shadow, and a tearful reunion ensues.